For someone who has built his artistic career rummaging in elements of the memory (both personal and collective), and for someone who keeps updating his instagram, youtube and issuu with nostalgia-tinted works (even if it is not a case of nostalgia for its own sake!) it is strange how ambivalent my relationship to the past is. People who are familiar with my artworks (be it digital, paper, or video art) are often shocked that - apart from a nondescript folder with a few papers - there is little to show physically for the archive I keep talking about. For a while I was part of a whatsapp group for the extended family, but to be honest, how many times can we still recollect how we played hide and seek and how my cousin ended up hiding in the washing machine? Or how we used to go to the church in the middle of the forest for the end of summer festivities (the church which is now in the middle of the highway by the way)? People who graduated with me in high school have also tried to include me in a group of the same vein, from which I unsubscribed immediately. Mind you there is no bad blood between myself and other people who were with me in school, but truth be told, today we have almost nothing that binds us. I bumped into the moderator of the group the other day, helped his daughter register for her semester at the university where I teach, we had a nice conversation, but - well - this I can tolerate every once in a (long) while but interacting daily and reminiscing (again, daily) about the past is not on my agenda. To be clear, there are no problems between myself and my cousins, no arguments with old school mates, but also I am not someone who lives in the past. Before going further, I must - for the sake of authenticity - say that I can keep a grudge for a long time. Actually, I met - not long ago - someone from my past, who was did something which was not kind to me, but he crossed the street to effusively greet me, warmly hugged me, and we walked together for a long time before I got to my destination. Mind you, that person was on my persona non grata list, but there you go, the guy probably did not register what he had done to me, and you know - with time and age - I guess a decade and a half is long enough for me to let go of my grudge. Still, I think I am quite selective of the people I regularly keep in touch with. And perhaps I realize that, well - relationships of most kinds - are transient. I freely admit that friendships end, something with which my students struggle to come to terms with. And I always try to soften the blow when they reach out to me to explain problems with people with whom they were quite close. Sometimes, as we say in Arabic "el m3aze bitdalla bil alb" (affection remains in the heart), and that is true. I sometimes bump into people with whom I have worked, or collaborated, in the past. We have our bonanza of jokes and whatever. Case in point: I gifted a friend and his wife a wedding present which was composed of original artworks featuring them, a former client with whom I have not worked since 2001 (this being 2017 that is a long time back!) dropped by for dinner at their place, and fell in love with the pieces. Beaming with pride my friend said "yes, this is our wedding gift from Tarek Chemaly" not knowing that the man and I myself had worked for a long time together. Naturally, the client spoke at very length at how fond he was of our collaboration which only made my friend and his wife even beam with more pride. When the incident was reported to me, there you go, I too spoke with effervescence about him! So you see, I have nothing against the past. But of course, having the acute memory that I have, makes me remember incidents that other people have forgotten. However, I do live in the present with my feet grounded, and - hopefully managed to extrapolate from the past enough wisdom to go on further with steady paces. Lately, I had a major falling out with someone with whom I have been friends for a long time. The issue was so violent and bad that I simply went to my hard drive where all my archive is stored, deleted all images I had of him - and cropped the one we had together. It was a quick process, I obsessively label all the images I have so that I could find anything in my archive easily. Suddenly, there is no evidence of us having been personally close (even if professionally there are still traces of that and I did not mind it, we shall no longer collaborate in the future). 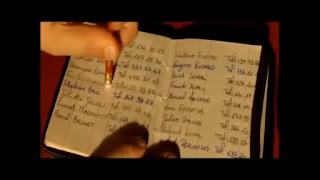 All of this reminds me of that scene early in the movie "Le Fabuleux Destin d'Amelie Poulain" where the man insists on writing people's numbers by pencil to easily erase them when they die. I guess the days of using such a telephone book are long gone, but a few months ago, I went through a major purge deleting photos of all people with whom I am no longer in touch - and who, for a long or a short while, were part of my past. I guess it is a given that jgps are as easy to remove as phone numbers written in pencil. As we move forward to 2018, this is my traditional end of year missive. 2017 proved a major year for culling relationships which had grown toxic in my life, I paid my dues long ago yet still hanged to the shadow of foregone events. Then I pulled my classic "f*** off" and slammed the door behind me. 2018 seems a great year to move into. Hang in there with me!